So, thinking about the 66 items makes me feel really good. I have a nice collection of hand knit things around the house and all my friends and family have at least one hand knit item from me. I guess that it makes me realize that I actually AM accomplishing something. I also added up all of the finishing and repair jobs I did over 2007. Ava's red Smock Coat ARRRRGGGHH I have to work on that! Right now they are all on the back burner because I am working on a Top Secret project to submit to Knitty.com. The rules state that I am not supposed to blog about the project or pattern until it shows up in the issue, if it ever does. I'm really excited about it. I've never done anything like this before! I thought I might as well give it a try! The deadline is Jan 5th and I just decided that I wanted to do this so I have really been knitting every chance I get to get this all done. 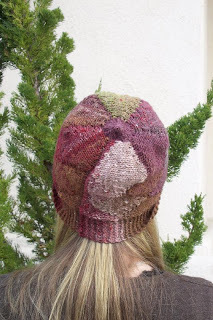 If Knitty decides that the pattern is not their thing then I will just put the samples on display at The Scarlet Skein and make a class out of it! You see, I am thinking positively. I'm trying not to get my hopes up too much. 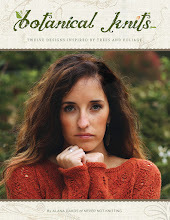 I'd also really like to submit a pattern every quarter to Knitty. I have some good ideas and I think it will be really fun. We'll see how this one goes though. 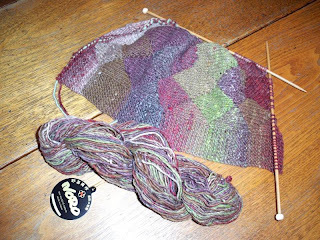 I recently bought a skein of Noro Cashmere Island completely on a whim 2 weeks ago at work. 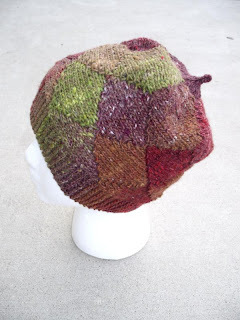 Since then I discovered an awesome free pattern on Ravelry called Short Row Hat. 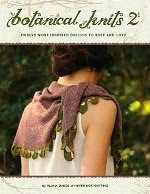 It was a perfect match for the Cashmere Island and would you believe it...a February class was born! 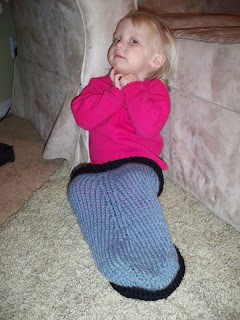 Here is a picture of my work in progress posing with the yarn I used. 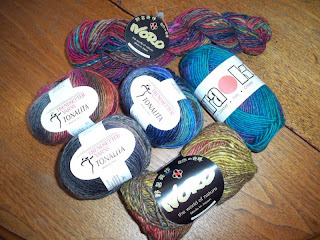 If you don't want to work with Cashmere Island, I think any of these yarns would work great with this pattern. I will post class dates and times when it gets closer to February. My clog family is now complete! 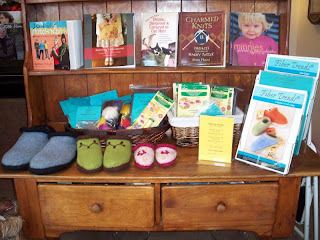 I set them up for display at The Scarlet Skein with the patterns and all of the needlefelting supplies. I think that they will make a fun class for January. The great thing about this pattern is that I found three shortcuts that will probably cut an hour or more off of the knitting time! I'm going to be sharing this technique with the students that sign up for the class. For the needle felting workshop, I am bringing all of the roving for everyone to use and I will be offering direction and instructions for using the tools. You can get all the supplies you need for both classes at the shop. These are just the class times for January, but as with all of my classes I will be offering the Felted Clogs class for several months. Look on the website for current class times! 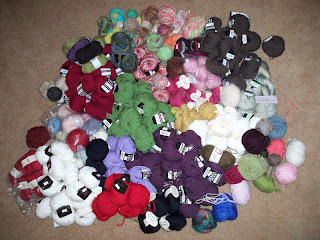 Call 805-466-YARN if you are interested in signing up! I was so excited to finally finish the clogs. They fit each one of us perfectly. 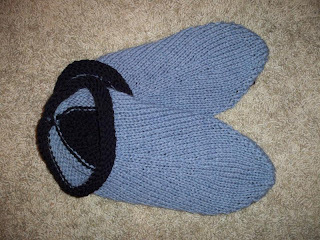 I was really happy that the pattern offers such a great size range with special instructions for different foot widths. I keep having little clog fantasies where I envision everyone in my family getting a pair. I should probably finish the 5 projects I have going on now before indulging in that fantasy any further. Speaking of my knitting projects... I'm getting nothing done!!! I keep getting more and more j0bs from customers!! Not that I am complaining or anything. 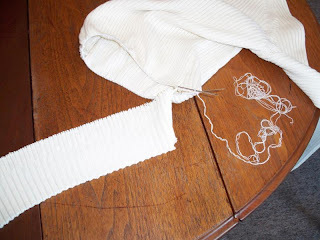 Currently I am repairing an afghan and knitting a custom stand mixer cover. I better get knitting! In a previous entry I said that I was going to get my last pair of Felt Clogs done by last Wednesday. I agreed to alter a machine knit sweater for a customer. 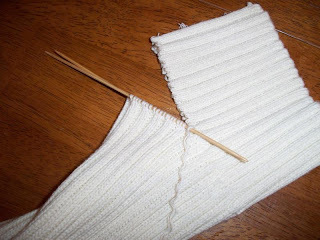 I cut off sections and unraveled one stitch at a time and carefully bound off the stitches on size 0 needles. I didn't think that this would be the time consuming monster it turned out to be when I took on this job. I simply thought I could snip some threads at the bottom and unravel. That didn't work out. 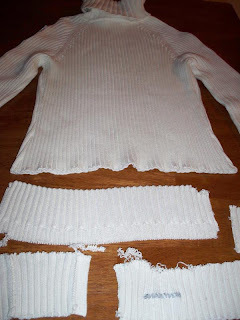 This sweater was made with literal cotton 3 ply thread that just split, tangled and knotted up like you wouldn't believe. I maybe spent 15 hours or so getting this sweater under control. Lesson learned: Just say no. It isn't worth it! Is it a wierd hat? Is it a completely useless toddler sleeping sack? No! 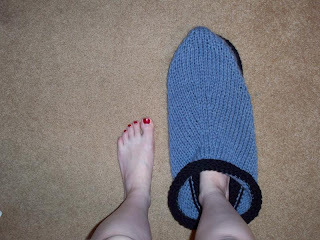 It's a pair of EVEN more gigantic Felt Clogs! This is my last pair. These are for Jason who wears a 13-14 shoe. Are these clogs ridiculously huge or what? I'm going to visit my sister-in-law tomorrow and felt the 2 pairs in her washer. I've got a useless front loader. So i'll be posting pictures soon. 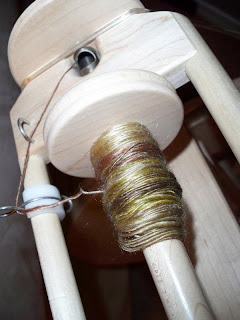 I also did a bit of spinning this week. This is the wool/tencel blend I got on my weekend trip recently. 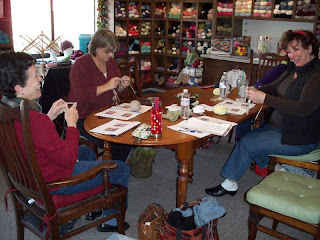 I taught my first "2 socks on 2 circular needles" class today! For the most part it was a success. It's a challenging technique to learn, and I felt all of the students hung in there even when things got tricky. I think that the hardest part about this is keeping everything untangled. At first it feels so awkward with the two balls of yarn and 4 needle points. It does get easier though. I told the class that I taught a friend this technique and at first she had trouble. 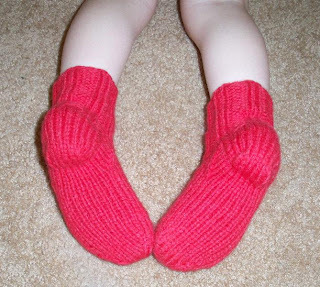 But a week or two later she had 3 pairs of child's socks completed. So just like anything with knitting, if you stick with it, it will get easier and easier. I recommend this class for anyone who is just plain old sick and tired of knitting that second sock. 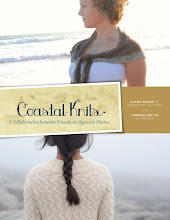 It's also great for those who want to expand their knitting knowledge and are up for a challenge. For current class times be sure to check the website. So... I got back from my trip and all of this came home with me. I had such a fun, relaxing vacation. One of the highlights was finding the coolest little yarn shop in Santa Barbara. It was unlike any yarn store I've been in. It was quaint, modern, artistic, yet cozy all at the same time! 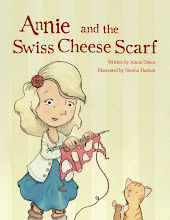 She had the awesomest selection of beautiful obscure yarns that are hard to find. I found that alot of the yarns in the shop were spun out of very unique fibers such as Camel, Yak, Seacell, Soy, and there was even an awesome stainless steel yarn! Here is a picture of a swatch made out of the Stainless Steel yarn. Its manufactured by Habu and it is surprisingly soft. Celeste the owner showed me that when you squeeze the swatch it maintains its shape due to the memory of the stainless steel. Crazy stuff. Celeste was kind enough to let me take a few shots to show off her beautiful space. After walking around patting all of the beautiful things I finally settled on the Handmaiden SeaSilk because I have heard about this yarn for a long time and it has always appealed to me. I've read that as you wear the garment made from the yarn the Seacell which is a form of seaweed leeches skin softening nutrients into your skin. So of course that sealed the deal for me. The store and all of the things in it were lovely. The owner was also lovely. Very kind and helpful. I definately recommend checking this store out if you are in the Santa Barbara area. The only problem I had about the shop is that the yarn there is just too wonderful. Afterwards when I went to knit on my "works in progress" with my so-called-nice-yarn, everything just looked and felt cheap. I think that The Loop and Leaf could potentially turn me into more of a yarn snob than I already am if I spent too much time there. While I was gone I had big plans of doing lots and lots of knitting. I only got a few inches of Ava's red coat done, and one Felt Clog. That sucker sure is huge before felting! When I got home I was so inspired by all my needle felting supplies that I had purchased so I immediately needle felted onto Ava's felt clogs that I had just finished. I think that they turned out pretty cute so I put them on display today at The Scarlet Skein. This was my first attempt to felt an item by hand. I don't recommend it. It was hard and it took forever! 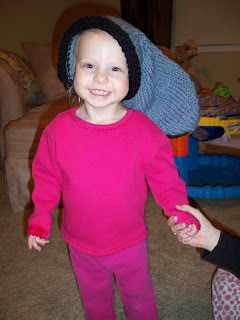 My new knitting plan is to knit my other felt clog, knit a pair for my husband, and work on Ava's red coat on the side. I'm going to stick with those things at the moment because I've been feeling a bit overwhelmed with all of my knitting projects. I hope to by next Wednesday (The next day I work) have all the felt clogs done and needle felted. Ready for display! 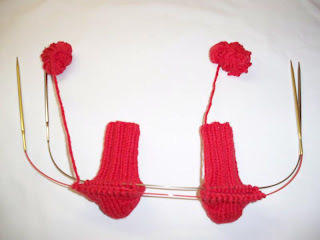 On the 15th is my first class I will be teaching with knitting 2 socks at the same time on 2 circulars. I am charging $35 for a 3 hour workshop and my workbook is included. If you are interested in this class you can check out class times and more information on the website.